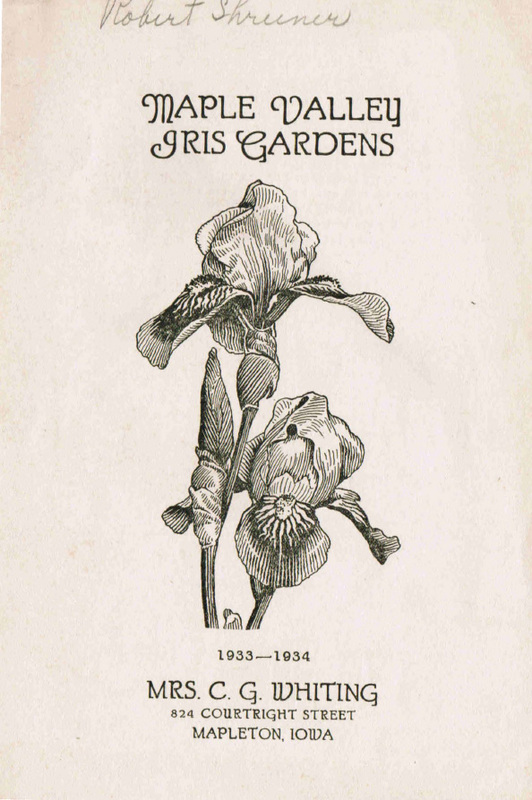 "I did not put out a new catalog this year, just a small price list, and instead of sending it to you, I will send this marked catalog with those really standard varieties of which I have a surplus . <Marked for 25 or 50 to spare, X 3 to 12 to spare on trade. I grew so much Iris before I began to sell any that I have quite a bit more than I can dispose of. My prices were pretty high last years as I didn’t care much whether I sold it or not. I would just as soon trade with you at theses lower prices ( or meet yours if in any case they are lower) for a few newer things as most of my iris money goes into newer things anyway. When you have time perhaps you would send me a list that you could use and I will send them whenever you say. They have all been checked true to name, and could be used for trade if you wish, for our plants are in fine condition this year.